On my walk home from work, it was hard to miss the colourful pop-up restaurant in the middle of a buzzing Exchange Square in Manchester. A 2-storey eaterie with modern interior, music playing and geek-uniformed waitresses running around as they waited on happy diners, this looked like the place to be on a Tuesday evening. 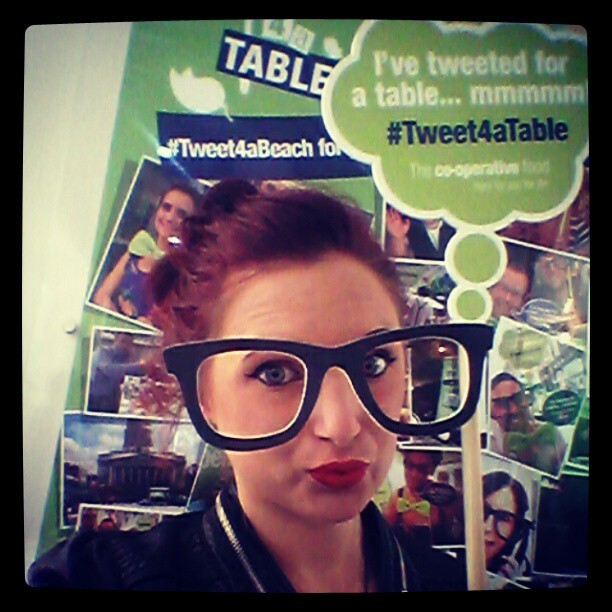 Surrounded by banners with the @Tweet4ATable branding coupled with the hashtag #Tweet4ATable and Co-Operative Food logo, as soon as I got home I tweeted the photo I took and researched more about this intriguing event. 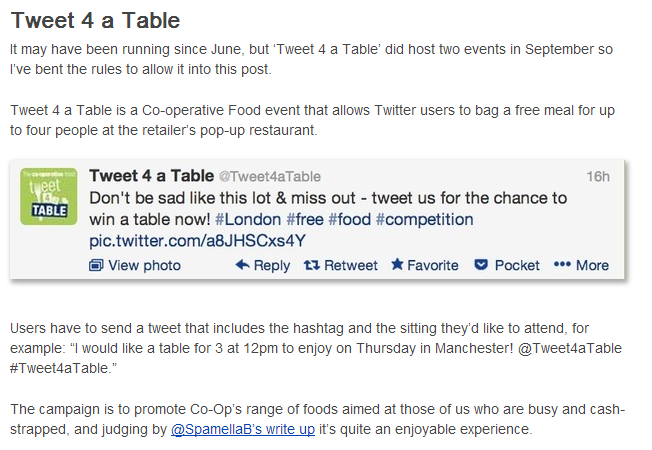 Skimming through the tweets from @Tweet4ATable, it was clear that this UK-wide campaign was hugely popular and interactive. 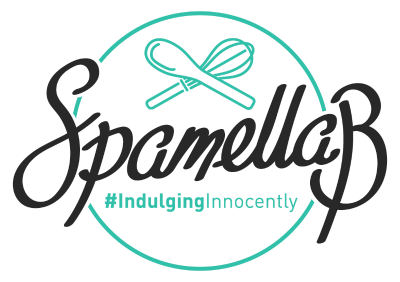 For me, anything that combines food, social media and a live event is a winner in my books, but of course some brilliant ideas can’t be guaranteed to translate successfully from pen and paper to the real deal. 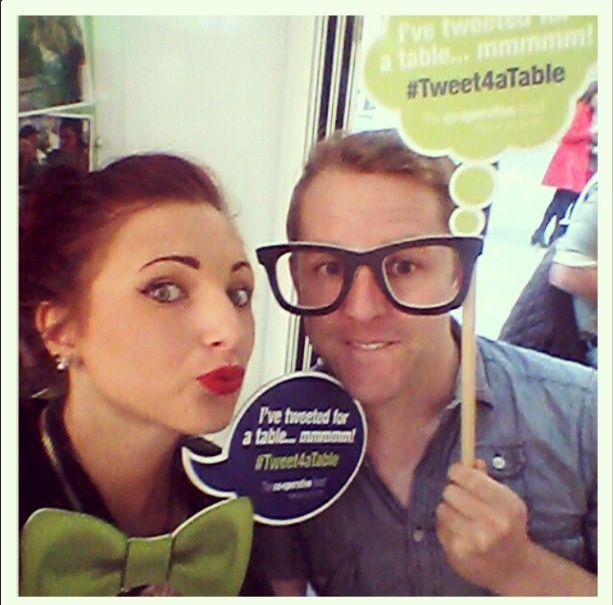 From witnessing the #Tweet4ATable event as a passer-by and seeing the amount of tweets and retweets of people having a great time enjoying decent food, I had to get involved. Bascially, the #Tweet4ATable concept is simple; follow and tweet with the hashtag saying which day you would like to go, what time, how many guests (a maximum of 3 + yourself) and why you should win. The lucky chosen ones are sent a direct message to confirm their 45 minute table sitting, whether in the afternoon from 12 noon – 2.30pm, or evening 4pm – last sitting at 7.15pm. The reason for this campaign? “Eating great food shouldn’t have to eat into your time, or your wallet. The Co-operative Food has everything you need to knock-up a sensational meal in a matter of minutes, but why take our word for it?” In which case, Co-Operative Food are hosting these events across the UK, from Glasgow to Brighton, to promote a new range of products for time-poor and cash-strapped folk, to try out for themselves in a fun, sociable environment in their city. Funnily enough, the same evening I’d tweeted the photo and got excited by the whole event, I was thrilled to be invited by Louise aka @OriginalRogue via Twitter (naturally! ), to come down and do a write-up for my blog. So on Thursday evening, I met James after work and we arrived at the bustling location for 6.30pm, hungry for the food awaiting us. Welcomed by Louise herself (lovely, bubbly and equally as obsessed with social media, music and food as I am! ), we were taken to our table inside by our friendly waitress. The American/sporty uniforms complete with long stripy socks and geek glasses were awesome, bright decor was inviting while the chilled out music perfectly complimented the surroundings. Sipping a refreshing glass of Co-Operative Fairtrade Chardonnay, we ordered our food. James and I are gluten intolerant but thankfully the ‘Truly Irresistible Hereford beef burger’ were suitable, so the Naked option (served with no bun) was ideal. I went for the ‘El Burger’ while James decided on the ‘Beast’ option. Our food arrived swiftly on a wooden board with a mini bucket of American-style fries, complete with various Co-Operative condiments like chilli-infused oil and ketchup, of course. You know when you’re eating something so delicious that you don’t talk during a meal? That was the case! My burger, topped with Spanish chorizo and Mozzarella served with lettuce, tomato and a fabulous ‘Truly Irresistible tomato & chilli chutney’, was absolutely divine – juicy, chunky, flavoursome and fresh. 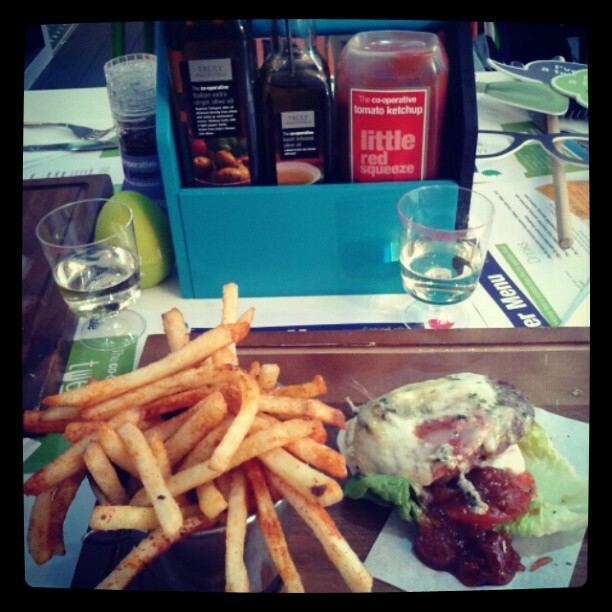 James’ choice was the same but with the addition of Blue Stilton, which equally went down very well. Together with the crispy, paprika-coated fries, this was a simple but delicious mid-week treat. With some time left for our food to settle, we had a play about with the fun, daft props on our table – we’re talking glasses frames and bow ties with quote bubbles saying, “I’ve tweeted for a table…mmmm! #Tweet4ATable”. We love quirky touches like this as it gets people to indulge in their fun side, take photos and engage with the campaign in a visual way, for both the brand and their own benefit. Before we knew it, our time was sadly up. As we left we were given money-off vouchers for dessert – cheesecake! – which was handy as there’s a Co-Operative shop on our walk home, so our night was rounded off very nicely indeed back at our flat. Our verdict then? 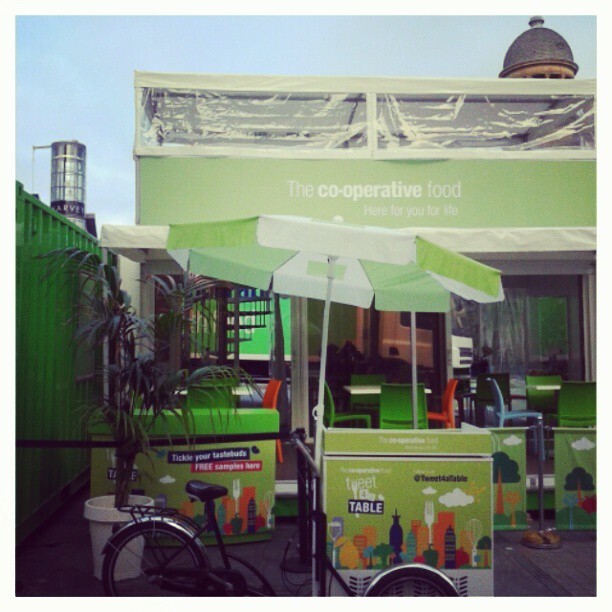 A fantastic, creative and engaging campaign which introduced us to Co-Operative food in a really enjoyable way. By combining social media and photo opportunity elements with cool branding and food appealing to all tastes, this was a winner from the start and it was a pleasure to experience ourselves, so thank you to Louise and the team for a great night! Today, I was thrilled to see not only that Mr Moth had mentioned it as one of his top 7 in his ‘Seven great social campaigns from September’ blog, but with a link to this very post too 🙂 Thank you again David, the campaign certainly deserves recognition!.